Spotted this tweet by @jakeludington regarding the Microserver G8 – I wanted to share! HP displaying custom coloured doors at HP Discover in Las Vegas. As you can see, there are different coloured bezels on display. Will you get a second colour in the box? Nobody knows yet. I must admit, the red looks really nice, and the blue would blend nicely with the LED lighting. Customisation of the Microserver – HP to steal ServersPlus ‘Pimp My Microserver’ idea? 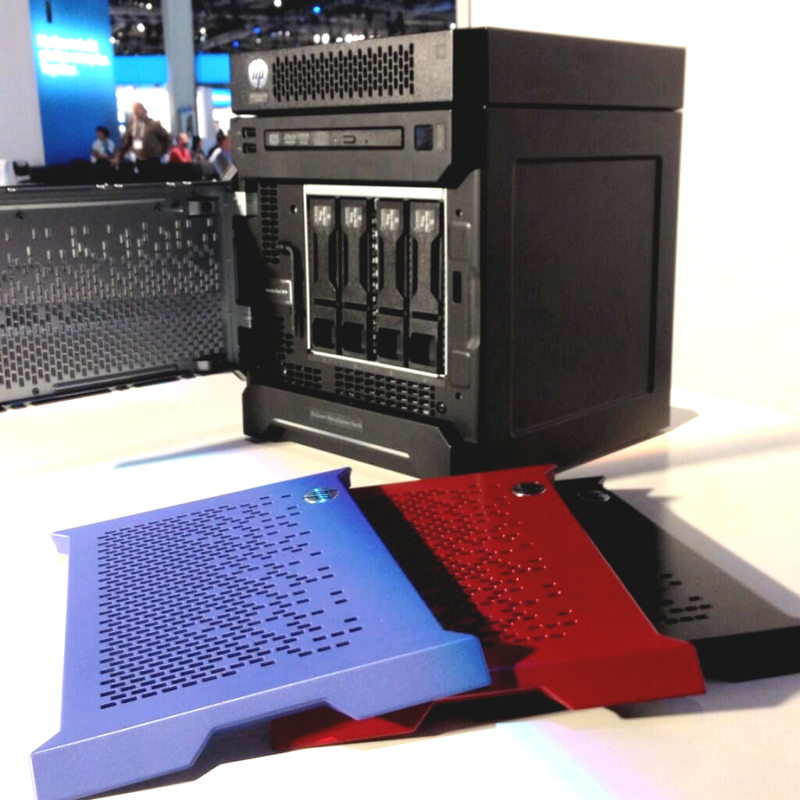 On the eve of the official product announcement for the Microserver G8, we have been passed more information from a HP Source, and on the face of the information provided it would appear that HP is considering offering kits to Mod Your Microserver. Previously ServersPlus in the UK ran a ‘Pimp My Microserver‘ competition, which was a pre-cut decal kit that you could apply to your Microserver. 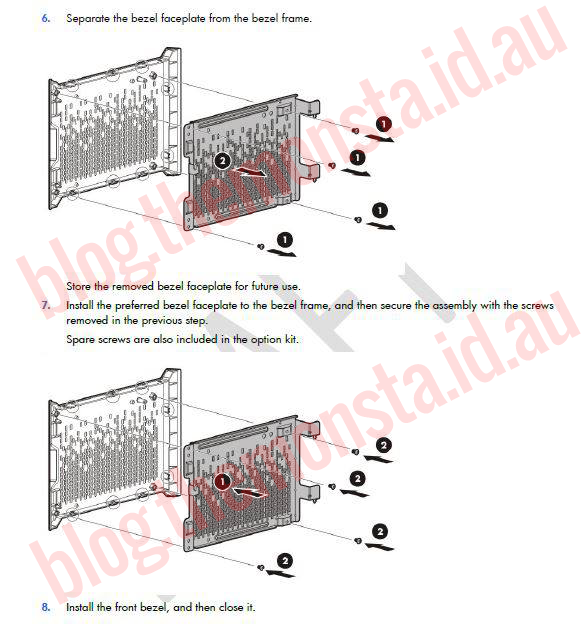 As shown previously in the Orange Door version of the Microserver, more has come to light in retail kits that you can change the door colour, and now possibly the perforation shape, size and pattern of it also. It could be very possible that HP will organise a number of ‘Customisation kits’ with a different door faceplate, and some decals for each side of the Microserver. 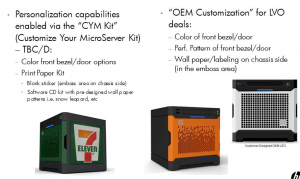 Now I love a Slurpee as much as anyone but I am not sure if many people would like a ‘7-Eleven’ design for their Microserver. I definitely would like to see some VMware ones, maybe a set of HP logo decals for the sides. I am also very sure that some people would love some Linux-themed decals, maybe a CentOS? 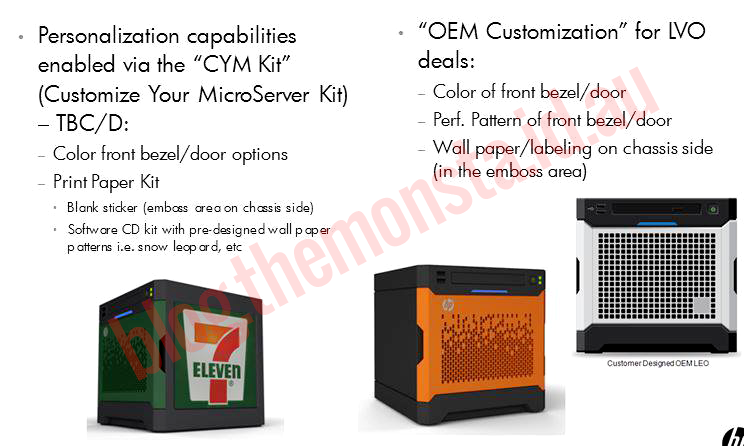 It would appear that those OEM’s wanting to order a large enough batch (LVO stands for Large Volume Orders) of Microservers could indeed be able to order a customised door with a different pattern to the ‘Gen8 Family’ pattern. One would think that third-party vendores could take the base Microserver and turn it into a variety of different appliance, adding different Operating Systems and options. There could indeed be a supported NAS from a current major player or even a new player, built on the Microserver platform. The ‘Whitebox’ door above with a complete-coverage ‘square’ punch actually looks pretty decent, but you could change the punch shape to circles or hexagons too. I’d love to see some of you out there come up with a few photoshop ideas on what you would like to see on a door. So go ahead, make them and post. 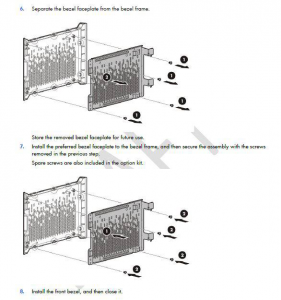 Also, HP have a document on how to change over the door. Looks like you could sandwich some open-cell foam in there for dust suppression too. Lots of options start springing to mind now.